New government legislation will soon come into effect and, as of 30th November of this year, all operators of drones between 250g and 20kg will need to be registered - and all registered drone users will be required to take an online competency test. Subsequently, the area around airports where drones are banned from flying within will be extended. The legislation will also give police additional powers to land drones and require users to produce the appropriate documentation, and will mean that they will be able to search and seize drones - and retrieve the data stored on them - where an offense has been committed. For minor drone offenses, police will be able to issue fixed-penalty notices of up to £100 for failing to comply with an officer when instructed to land a drone or not showing the registration documentation required in order to operate a drone. This new legislation has been introduced in response to the disruptions at Gatwick airport last month, whereby the many flights were suspended for more than 36 hours after drones were reportedly sighted flying near the runway. The disruption affected 140,000 passengers and 1,000 flights and is said to be the biggest disruption since the airport closure in 2010 due to the Icelandic volcano. 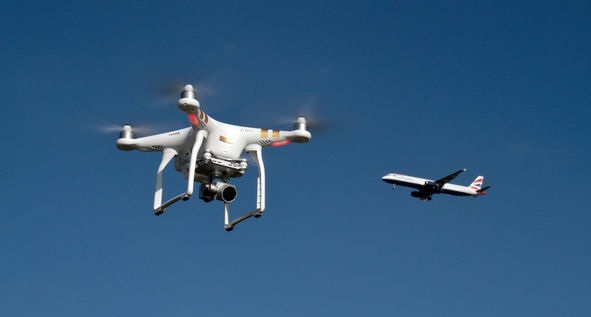 The government has also said that it will expand technology for detecting and repelling drones from airports and prisons, in order to prevent any repeat of events like those which occurred last month at Gatwick airport.